This entry was posted in Single Note Exploration and tagged Christine Nagel, Dior, Francis Kurkdjian, Juliette Has A Gun, Miss Charming, Miss Dior Cherie, strawberry. Bookmark the permalink. ← The Perfume of Mystery: Black. Puredistance Black. I always love hearing details of your childhood in the Ukraine, where so many things were done differently. I have done strawberry picking on a PYO basis, but never as a form of ‘national service’. I did try hop picking as a summer job once, but it was a nightmare – the conveyor belt went too fast and up at a steep angle, making it hard to reach the offending bits of greenery we were meant to pull out. As for a strawberry note in perfume, I have a similar take honesty or shoe – as Siri has seen fit to cast ‘Miss Dior Cherie’ – but cannot recall Miss Charming. I am curious to try it now after reading your review! Vanessa, I think you might like Miss Charming: it’s not too loud but present and the drydown is very lovely. My aunt loved strawberries and used to work at her neighbors strawberry stand every year. I don’t like bad fruity notes in perfumes, but I agree that fruits can be done right once in a while. I haven’t tried Miss Charming and probably won’t because I really don’t like MFK either. I’m sure I’ve unknowingly tried some of his stuff but I won’t knowingly support him. Don’t know him personally but what I know of him, I don’t like at all. Interesting topic. Fascinating story too! I will have to ask some other Ukrainian friends about their experiences. 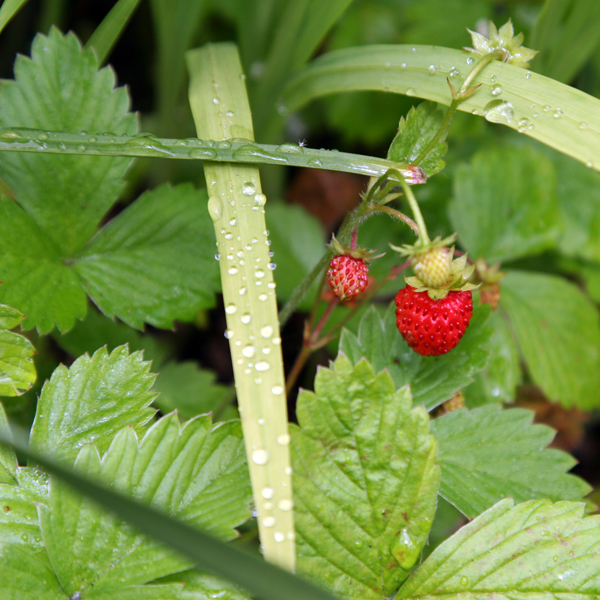 I recently read another blog entry – don’t remember where – about a strawberry perfume. I have to admit, I run the other way when I hear if any fruit notes. I don’t care for a single one, unless you count citrus as fruit. Fruit notes may be an avenue of exploration, though I have a strong aversion to any food-like perfumes. That includes a prominent vanilla note. had a much-coveted Barbie perfume maker! This was a little kit with ingredients and bottle and labels! It was a little before my time, so it was an older girl that had it. But I can still smell the strawberry perfume she made – it smelled just like strawberry candy! As I child I would have given almost any of my toys to have such a kit! Ukraine wasn’t unique: it was a known activity in the USSR in general. I heard that some other republics had it even worse with cotton harvesting. I’m sure that sooner or later you’ll find a perfume with prominent fruit note that you’ll like – keep looking! I never really thought about strawberries in perfume. It invokes pictures in my mind of Strawberry Shortcake children’s cologne or lip gloss or something of that manner. I don’t think I’ve ever run into them in a perfume! I think that a strawberry note can be quite beautiful in a perfume, and I really love the strawberry note in Cartier L’Heure Convoitee, which is a mostly carnation perfume which most bloggers hated, but I think it’s really gorgeous. And as further evidence that I’m either a contrarian or a perfumista oddball (or both! ), I quite enjoyed the strawberry note in a seriously gourmand perfume called Nez a Nez Ambre a Sade. And it makes total sense there, once you do research on the Marquis de Sade and find out that he had his wife delivering gourment goodies to him in prison, and apparently received a generous number of parcels of fresh strawberries. I’ve not smelled it, but the fragrance created by Givenchy for Audrey Hepburn – L’Interdit – features a strawberry note, which in the vintage version, was supposedly very well done. oh Suzanne, I thought I would chime to say that Nez a Nez Ambre a Sade is one of my very favorite perfumes! I fell in love with it whilst perfume shopping on my honeymoon. Later I read the online reviews and I was horrified that people thought it was too sweet, too much berry, etc. Oh well! I love what I love. Susan, oh it’s so good to hear that someone else loves Ambre a Sade! I find it no sweeter than many of the Serge Lutens fragrances and my husband likes it so much, he has thought about buying a bottle for himself (he likes the tobacco note in it). My husband bought me Ambre a Sade for my last birthday – he really likes it on me. It’s a good question… I’ve never thought about it before :) Most likely it was transported “as is” to the closest city and sold – there always more demand than offer. I will try Cartier L’Heure Convoitee the next time I get to Saks: not because of the strawberry but because of the carnation. As to Nez a Nez, I don’t think I’ve ever tried any of their perfumes. Somehow our paths have not crossed yet. Hi Undina, wow, your story of the kolkhoz is pretty crazy. Such a different way of life. I actually like strawberry notes in perfume, that is, if they smell realistic and not like fake strawberry FROOT (as in many mainstream perfumes). Two of my favorite strawberry perfumes are Nez a Nez Ambre a Sade (which I guess is not just strawberries but several types of berries, although the strawberry is prominent) and the Perfume Pharmer’s two natural Strawberry Passion perfumes, Green and Cream. Those two were done by Kedra Hart of Opus Oils and they are very nice. I have been meaning to write about them for a while. I do like the original Miss Dior Cherie but I’m so confused by all the flanker and reformulations at this point (although the current parfum version is nice, it’s not much like the original sadly). I’ve also wanted to try L’Interdit for some time, but haven’t gotten around to it. I thought that Strawberry Passion were about strawberry flower rather than strawberry fruit but I haven’t tried them so I might be mistaken. The second vote for Ambre a Sade… I’ll have to find it and try soon. I can send you some Amber a Sade! Shoot me an email with your info and I’ll get it in the mail to you. My email is somerss at gmail dot com! Oh, I will add one more. I could SWEAR I smell strawberries in Elsa Schiaparelli Shocking. But when I look up the notes it is not there. I don’t know if it’s an affect of the honey and flower notes or what. I suppose your mileage may vary with that one though! I have a vintage mini of this one but I’m not sure it smells of anything but a vintage perfume any longer. I know what you mean. Mine is also a vintage mini and I can’t decide how I feel about it. Undina, I think you have bumped me into caring about perfume again! I may even post soon, but I had to tell you that you start me lemming. Thank you – I was worried that I was never going to be interested in new scents again. I think once summer is over and you’ll spend more time inside, you’ll feel more inspired to do some testing. What a tender retelling of that episode from your childhood. Though they are the very opposite of collective farms, I remember too the all too brief soft fruit season when my childish hands would be pressed into action harvesting raspberries, blackcurrants, gooseberries and, yes strawberries from the back gardens of grandparents, aunts, uncles and elderly neighbours. I am sure I dreamt of the crop too! I never got on with Cherie, and no, well, after all these years of interminable changes. Who knows which Miss Dior is which and whether any is worth dating anymore. I had no idea either that Miss Charming was by “MFK”, I’ll try it again as I really do believe I rather liked it. Thank you for more wise and well told words. Dear Dandy, thank you for your kind words. I didn’t mention that in this story, but I was a lucky one: I had grandparents with an all-you-can-eat garden. Actually, yeah it does. :) It’s typical for me to REALLY explore a note, and when I’m done I feel “finished,” which means lemmings are extremely rare. I had done a major green exploration and found my top three, and was quite content until I stumbled upon 1000 Flowers Fleur No. 1 and fell hard for it. Except now I have a top four green and….. well, it kinda bugs me. Silly, but there it is, so I’ve started creating a TBS list for a fifth kind of green, what I call “soft green.” Some of the candidates include DSH’s Celadon, Diptyque’s Eau de Lierre, CdG’s Calamus and the new Providence Branch and Vine. I’m not sure if I have any perfumes in the “soft green” category. But I shouldn’t probably be counting perfumes in different categories – or I’ll end up “correcting” the wrong numbers. Hi Undina, Your story of your time in Ukraine takes me back to my mother’s stories of her childhood in Ukraine, I enjoyed reading it. I have always loved a strawberry note in perfumes, one such perfume I am a little bit embarrassed to divulge that I love it! Sarah Jessica Parker’s SJP NYC, I love spritzing it when I am home alone, it’s such a ‘happy’ smell. I have two of JHAG’s perfumes; Lady Vengeance and Citizen Queen, which I love, and always get asked what I am wearing. So I must sample Miss Charming. Thanks! Hi Janine, thank you for the kind words and welcome to my blog. With all JHAG’s perfumes I tried I have the same thing: I like them much better starting from a 60-minutes mark. Some openings are overwhelming for me. Miss Charming’s drydown is especially beautiful on my skin – so I can wholehartedly recommend it for testing. I like strawberry notes in perfumes, like many other commenters. But I am very picky about it. Ambre a Sade – no. Miss Charming – no. But Miss Dior Cherie is, of course, a big yes from me. How interesting. Now I’m even more curious to try Ambre a Sade: I’m still trying to paint a landscape of our likes/dislikes correlation. When I went to school, I remember we used to watch films about life in the Soviet union and I remember they showed kolkhoz:es, and wasn’t there also something named solchozes? Or is that just a figment of my imagination? Anyway, I also love hearing about how life used to be in your native country! Strawberry is a note I seem to stumble upon every now and then, and often in perfumes where isn’t mentioned in the note list. Today I wore “Good Girl Gone Bad”, and I get lots of strawberries in there, especially in the beginning. Actually, I get watered down Miss Dior Chérie (among other things), with both the strawberries and buttery popcorn, but no patchouli. You remember it almost correctly :) There were two types of those farms – Kolkhoz (a collective farm, the word itself is an acronym from “коллективное” (collective) and “хозяйство” (farm)) and Sovkhoz (a state farm, an acronym from “советское” (Soviet) and “хозяйство” (farm)). I’m not sure if anybody from even my generation could tell the actual difference between those two types. I’ll test again GGGB: out of three this one was my least favorite (including the name) so I do not remember any specifics about the perfume. It has a bit of tuberose in it, that I know you don’t like, so I’d much rather recommend the Musc Intense! As you know, I usually don’t like overly fruity notes but I quite like strawberry and raspberry infused roses. I guess I really need to sniff some of the JHAG perfumes. Many people have mentioned and I’ll add to their voices- I love hearing these tidbits from your childhood and seeing parts of your world through your writing. Thank you, Lavanya. I try not to overwhelm my readers with those recollections but some of the experiences just had to leave a trace in how I perceive life in general and scents in particular so I share glimps of them with all of you. I plan to do an episode on raspberry note soon. That was some experience you had as a child, something really different from people’s childhoods in the States. I used to self inflict strawberries, because i made jam, so pick your own berries, and then a hot kitchen for hours, with jam boiling on the stove and me praying it would not burn. if it didn’t voila jam! Strawberry perfume…Fragola Salaataa of Hilde Soliani is the best I know. I’ve never made any fruit preserves in my life. Those were very popular in the Soviet Union because fruit and berries were available only for a short period of time (2-3 months a year) and there were not that many other sweets available (though mostly people would make conserves – whole fruit preserves – than jams, spreads, etc.) but I was too little to do those. When I grew up fruit became too expensive to do anything but eat them and then I moved to the U.S. where I can buy preserves when I want them and I didn’t have to learn how to make them myself. One of the many reasons I love perfume blogs – we take all of our different experiences and relate it to something we enjoy: perfume. As far as strawberry perfumes, there are so many bad ones out there. And you mentioned the 2 I first thought of. I’d add Perfume Pharmer Green which reminds me of picking strawberries. And Nez a Nez Ambre a Sade which is like strawberry bubblegum amber (know that sounds gross but it’s good). I remember Phaedon Pluie de Soleil being a nice strawberry fruity floral but I’ll have to dig up my sample again and check again. I tried it a long time ago. And oddly I got tons of strawberry from Pacifica Tuscan Blood Orange but only the spray. 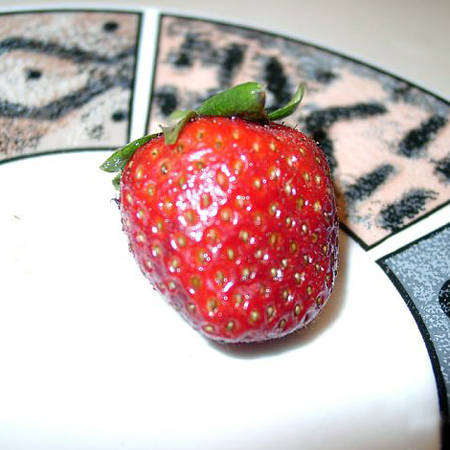 It was strawberry fruit with a good blood orange. Both Green and Ambre a Sade have been recommended by other commenters so I will get to trying those soon: I think that if a perfume gets recommended despite having strawberry in it, it must be good. Phaedon made a very enjoyable lilac so I might imagine them doing a good job with other difficult notes. As to Blood Orange, I think I read somewhere else also about it having a nice strawberry in it. I’ll try it once Isee it at a store next time. The original Hanae Morie always seemed to have a strawberry note to my nose…I liked it enough to go through a few bottles. I will have to research now to see if my nose was smelling correctly! I am happy to report that my nose was accurate…there are other berries but strawberry is one of the dominant top notes in Hanae Mori….I also noticed just now that another commenter mentioned Pacifica’s Tuscan Blood Orange..that’s a good one too…did not know it had strawberry as a note. Oh and there is also peony in Hanae Mori….I am starting to see a trend here…turns out I gravitate towards peony fragrances :)…as you know I am currently wearing Chloe for your rose challenge and unbeknownst to me it has peony in it too! Have you tried Armani’s Pivoine Suzhou?